Four Seasons Qigong~ A thousand year old set of exercises for adjusting the body's energy with the seasons. Great for pain relief. Eight Pieces of Brocade~ Very famous thousand year old set for healing the body. Especially good for stress and severe illness. Tai Chi Warm-Up~ A simple warm up routine for loosening the muscles and joints. Standard Short Form (24) Tai Chi~ This form was developed in 1956 by China's National Sports Commission. It is the standardized Tai Chi form taught in schools and colleges throughout China. 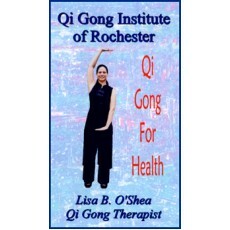 Here are some clips of my Rising Lotus Medical Qigong form, one of the many exercises offered on this DVD.